I went digging through my cookbooks for the first time in a long time this month. Now, I don’t know about you, but I have A LOT of cookbooks…TOO many, some might argue (like my dear husband :) ). I’ve been gifted many, bought plenty myself, and inherited some great classics over the years. Most of the drawers in this buffet table are stuffed to the gills with cookbooks. HOWEVER, I have to be honest. I hardly look at cookbooks anymore. Do you? I do all my recipe sourcing online. 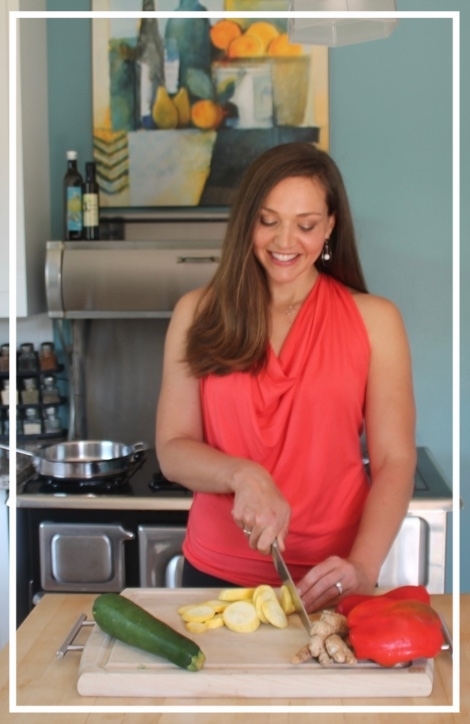 Mostly because I like looking at reviews to make sure I’m getting a good, well-tested and liked recipe, or because I like to see new and creative ideas that are swirling around the food blogosphere to keep things interesting in my kitchen. The Recipe Redux theme this month was to grab a cookbook and “Redux” a recipe from a page with any combination of the number ‘2017’! A fun way to celebrate the end of another year and a great way to flex the creative muscles to take any old recipe and make it healthier. 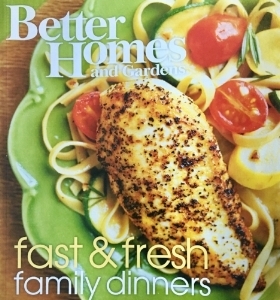 The recipe I chose to redux was on page 21 of Better Homes & Gardens Fast & Fresh Family Dinners: Pesto Penne With Roasted Chicken. This is a pretty basic recipe with simple ingredients, which meant it really was fast and fresh, but there was definitely room for improving the nutrition. I swapped out the basic white penne pasta for my favorite chickpea pasta, rich in protein and fiber. I left out some of the extra cheese because there is already plenty of flavor and healthy fat in the pesto. Oh, and per usual, I added A LOT more vegetables! The beauty of this simple recipe is it literally took less than 30 minutes to make from start to finish. I know, because my son STILL only naps for 30 minutes and I was done before he woke up! It could take even LESS time if you use a few shortcuts. For example, I used raw chicken, cut and cooked it. However, you could use convenience product like pre-cooked chicken strips, a rotisserie chicken, or even make this meatless by using chickpeas instead of chicken! I also used a store-bought pesto, but if you have some extra time or it’s summer and basil is in season, you might try whipping up this delicious, easy cashew lemon pesto. I’m all about speedy meals these days with baby in tow and such limited time to prepare them. This meal really fits the bill. It truly is a one pot, 30 minute meal, so dishes are minimal. It checks off the boxes in the protein, smart carbohydrate, healthy fat AND veggie categories. It’s super flavorful and the whole family loved it! Let me know if you try it and how it goes over with your family! While pasta cooks, wash and chop broccoli, bell pepper, mushrooms and tomatoes. Cube chicken breast. When pasta is cooked, drain in colander. Add 1 Tbsp to empty pasta pot and heat over medium high heat. Add broccoli and mushrooms to pot and cook for 3 minutes. Add peppers to pot with broccoli and mushrooms and cook additional 2 minutes. Remove vegetables from heat and transfer to a large bowl with cooked pasta. Add 1 Tbsp to pot and cook cubed chicken over medium high heat for about 5 minutes or until chicken is cooked through. Transfer chicken to bowl with cooked pasta and vegetables. Add halved cherry tomatoes and pesto and toss to coat. Top with salt and black pepper to taste. Use pre-cooked fresh or frozen chicken strips or chunks or cut up a rotisserie chicken instead of cubing and cooking raw breasts. Use store-bought jarred pesto sauce. Buy pre-chopped fresh or frozen vegetables - just be sure to thaw frozen veggies first in the microwave or add a few minutes to the cooking time.